Area firefighters stage inside Flint Hill Resources on Water Street in Peru, IL, with the Illinois Valley Regional Airport foam truck after a fire and HazMat call. 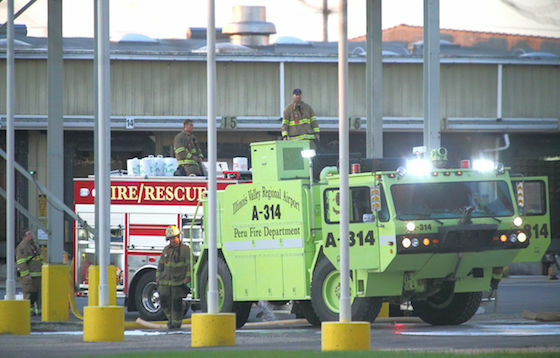 While there was a heavy synthetic smell in the air, the end result was an incident at Flint Hills Resources in Peru, IL, Friday ended up quickly contained with no sign of air contamination. Firefighters from five departments rushed to the plastics/polystyrene plant at 5:52 a.m. after the company activated an alert. East and westbound traffic on Brunner and Water streets ended up blocked off, but controls lifted 90 minutes later after Flint Hills and first-responders confirmed no chemical release, even when measured by parts per billion. Peru police chief confirmed there was a vapor cloud visible above the facility, but said it was moisture released during the containment process. There also was no fire. Though firefighters could be seen spraying an area on the east side of the facility, the hose was used not to disperse water but foam. This, Bernabei explained, was a precautionary step used to ensure containment. There were no immediate reports as to what chemicals were at work in the adverse reaction. A HazMat team ended up dispatched to the scene. All personnel ended up released from the scene shortly after 8 a.m. The last Peru vehicle left the scene at 8:11 a.m.
Flint Hills Resources LP, a subsidiary of Koch Industries Inc., acquired the Peru facility in 2007 after purchasing Huntsman Corp.’s U.S. polymers business, for about $350 million. Huntsman had employed about 85 people making expandable polystyrene, such as insulation.